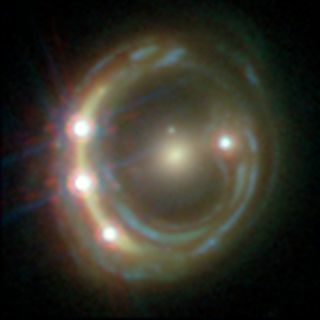 Hubble Space Telescope view of the distant quasar RXJ1131-1231. A foreground galaxy smears the image of the background quasar into a bright arc (left) and creates a total of four images — a phenomenon known as gravitational lensing. Such lensed views allowed scientists to come up with a new estimate for how fast the universe is expanding. The universe really is expanding faster than scientists had thought, new research suggests. The cause of this discrepancy is unclear at the moment, scientists said. However, the different types of data these various groups analyzed may provide a clue. To arrive at the new estimate, the research team — led by Sherry Suyu of the Max Planck Institute for Astrophysics in Germany and Frédéric Courbin of the École Polytechnique Fédérale de Lausanne in Switzerland — studied how massive nearby galaxies warp the light streaming from distant, superbright galactic cores known as quasars. Suyu, Courbin and their colleagues used NASA's Hubble Space Telescope and Spitzer Space Telescope, as well as a number of ground-based instruments, to do this work. "Our method is the most simple and direct way to measure the Hubble constant, as it only uses geometry and general relativity — no other assumptions," Courbin said in a statement. Gravitational lenses occur when the light from a more distant galaxy or quasar is warped by the gravity of a nearer object in the line of sight from Earth, as shown in this diagram. Riess and his team analyzed Hubble observations of two different types of "cosmic yardsticks" — Type Ia supernovas (stellar explosions of consistent luminosity) and Cepheid stars, which pulse at rates that are related to their true brightness. The Planck number, however, is a projection that's based on the spacecraft's measurements of the cosmic microwave background — the light left over from the Big Bang that created the universe 13.82 billion years ago. This montage rounds up five of the best lensed quasars (as well as their foreground galaxies) as seen by astronomers with the HOLICOW collaboration. The observations of these quasars allowed scientists to independently measure the Hubble constant and determine that the universe is actually expanding faster than expected. The discrepancy could also indicate that dark matter — the strange, invisible stuff that astronomers think vastly outweighs "normal" matter throughout the universe — has as-yet-unappreciated characteristics, or that Einstein's theory of gravity has some holes, they added. "The expansion rate of the universe is now starting to be measured in different ways with such high precision that actual discrepancies may possibly point towards new physics beyond our current knowledge of the universe," Suyu said in the same statement. Suyu, Courbin and their colleagues present their results in a series of five papers that will be published in the journal Monthly Notices of the Royal Astronomical Society.